Beat butter nicely in a plate and add all the other ingredients to it and mix well. Partition the mixture into multiple parts. 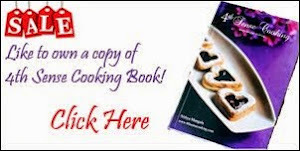 Take one portion of the above mixture and add adequate water to it to make dough. Now put the dough in the muruku maker and squeeze it in the oil and fry till it becomes crisp. Note: Do not mix the entire mixture into dough at one stretch. Doing that would lead to change of color of the dough when left alone for a long time. So make the mixture into dough by adding water as and when required. Now to make it more interesting, lets add flavors to the same dough. 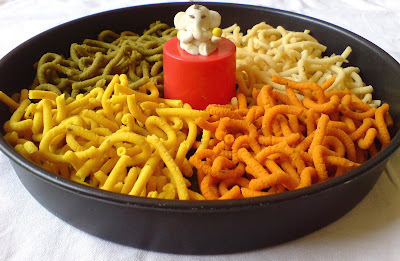 Add little chilly poweder and food color orange or red along with the above ingredients and make muruku in the same way. This would give you a gharam flavor and interesting look and feel. You can make another variation of using mint leaves too. nice murukus by the way... keep konjam stock for me bak home, ok? super photography!!!! Awesome!!! Hats off!!! 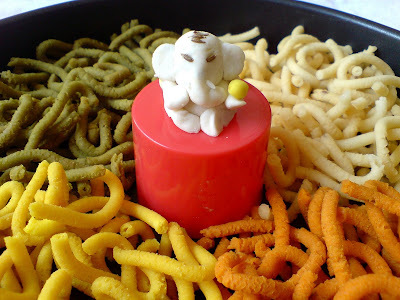 wow..damn tempting.am going to try it for sure.ganesha looks oh so cute. Thats looking fabulous.. ganesha looking cho sweet. Really tempting nithi.. Nice pictures too. That center piece is a stunner Nitya....Ganesha looks really nice..
and the Murukku is also very very colorful...Adding you to myblogroll. 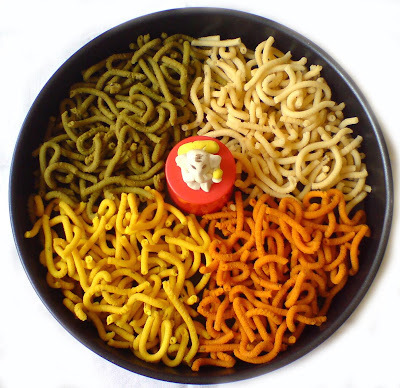 Crispy and colorful murukku.love the Cilantro and lemon variation. Nitya you have a wonderful blog, I love your creativity. Every post or pictures shows how creative you are. The Ganesh is so beautiful. More Kolambu - Guess the secret vegetable?? ?